Use Rewards for Amazing Magic Box! Magic tricks for those ‘hey presto!’ moments. Perform to admiring crowds, why not? 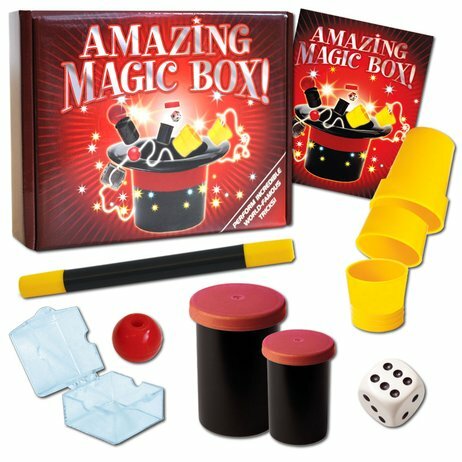 Conjure up a magic show to remember with the help of this nifty little kit. It teaches you heaps of cool tricks – and gives you all the stuff you need to perform them. String tricks, dice tricks and the vanishing wand: now it’s easy to master them all. It is a Book of Magic The Book Have a Surprise in The Book We can do Magic The Surprise are dice,a Little Ball,a Stick,Glasses, a Jar. kit with colour paperback magic trick equipment.